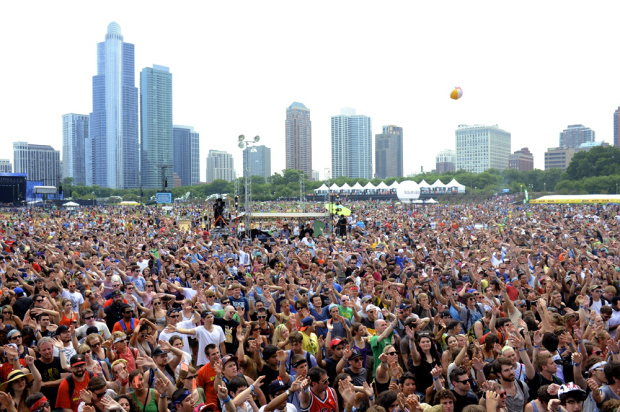 A crowd at Lollapalooza. In this case, looking for someone waving their hands might not be so helpful. When you’re looking for a friend in a crowd, think about the kind of clues he might give you over the phone to help spot him. “I’m wearing a red shirt,” he might say. “I’m in the back by the railing,” or “I’m standing up waving my hand.” It helps to focus on these details to narrow down the search. You can’t process everything you see all at once, and it would take forever to scan a large crowd one face at a time. Neuroscientists call this attention—attending to specific features or positions in your field of vision primes the brain to notice them more quickly. In the brain, some areas of the visual cortex specialize in catching non-spatial features, like color, shape or orientation; others specialize in extracting spatial cues such as direction of movement or the position of an item. The brain has to assemble these various inputs to make decisions about objects in our field of vision, and according to research by University of Chicago neuroscientists, both space-based and feature-based attention influence each other to help us find what we’re looking for, whether it’s a stoplight turning red or a friend waving his hand in the crowd. In 2014, David Freedman, PhD, professor of neurobiology, and Guilhem Ibos, PhD, a postdoctoral scholar in Freedman’s lab, identified a brain region called the lateral intraparietal area (LIP) that assembles and processes visual information based on feature-based attention—things like color and motion. In that study, they shed light on a unique characteristic of neurons in LIP and how they respond to visual stimuli. The results appear to show that the LIP integrates attention-based inputs from earlier in the brain’s visual processing system. For example, an area in the visual cortex called V4 responds strongly to colors and other features, and an area called MT responds to direction of movement. The LIP puts these together to help the brain find what it’s looking for based on color, direction of movement, and position in space.